The grooves left of Joyful Chimneys on South Trident Buttress on the Ben had fascinated me for years. The problem is that they need ice and by the time this has formed in early March, the morning sun is high in the sky and quickly strips the face. This winter boded well however – it has been a cold snowy season without too much sun – so on March 17 Robin Clothier and I went to have a look. As anyone who was out climbing last weekend knows only too well, the winds last Saturday were ferocious. When we reached the bottom of the route it was too cold to consult the guidebook so we started up the route from memory. We climbed an ice groove right of a long straight rib, and then continued up a steep set of right-facing corners to reach easier mixed ground above. 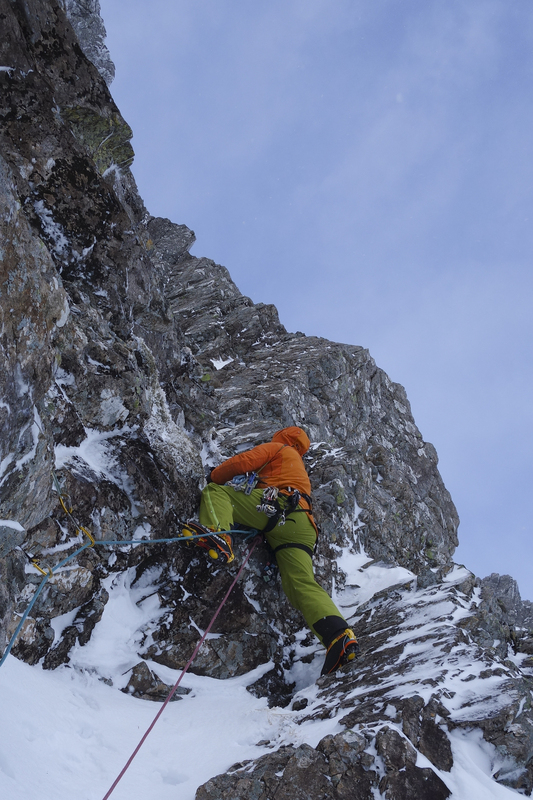 After two mixed pitches on a ramp overlooking Joyful Chimneys we reached the junction with Pinnacle Arête. The route was four rope lengths to this point and we then moved together up the final 100m of the arête to the plateau. It was a good climb, worth VI,6 for the second pitch alone, but back in the hut when I checked the guidebooks I realised that we had started up Jimmy Marshall’s original line of Joyful Chimneys and then joined the finishing pitches of The Copenhagen Interpretation higher up. Most folk nowadays miss out the first two pitches of Joyful Chimneys and start from Central Gully (as described in Mike Pescod’s guidebook), so we could have recorded our route as a link between Joyful Chimneys Original Start and The Copenhagen Interpretation finish, but it would have all felt rather unsatisfactory. New lines on the Ben are precious and need to be treated with respect, so there was no option, but to go back and turn it into a fully independent route. So next morning Robin and I returned to the long straight rib, but this time climbed the mixed groove on its left side from where a hidden traverse led right to the VI,6 corner pitch. Above, instead of following the mixed ramp of The Copenhagen Interpretation, we climbed an inset gully on the left that led through a series of vertical bulges to a broad platform on the upper right side of the second tier of South Trident Buttress. Hanging above was a beautiful right-facing mixed corner, white with hoar frost. This feature looks very steep from the corrie floor, but now we were underneath, it began to look possible. The problem was the wind was still very strong – so strong in fact that the most violent gusts were blowing the rack that was hanging in the belay up the cliff. But now was our chance, so I headed up into the corner, which soon bulged into a vertical flared offwidth with smooth sidewalls. There was no possibility of any protection but an unlikely cam placement lured me onto the vertical right wall where a series of holds led upwards. It was one of those pitches, that was far easier than it had any right to be, and although completely absorbing it simply flowed. Soon I was belayed at the top of The Clanger and from where a quick traverse onto the upper crest of Pinnacle Arête took us to the plateau and 20 minutes later we were coiling the ropes in the shelter of Number Four Gully. So all in all, it was a magnificent route and well worth the two-day effort to piece it together. As for a name, Robin suggested Joyless Grooves because of the ordeal with the wind, but Tempest Corners (VI,6) seems a little more appropriate. This entry was posted in New Routes and tagged Ben Nevis, Robin Clothier, Simon Richardson. Bookmark the permalink.